In 2012, more than half of Slovenia's land area was covered by forests (56% or 58% including shrubland), while other mostly natural vegetation accounted for 4%. Farmland occupied 35% of land area, while slightly less than 3% was artificial land. 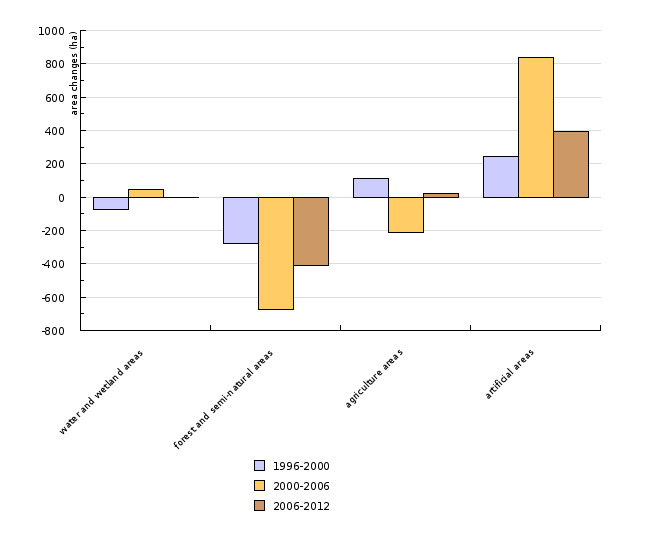 In the periods 1996–2000, 2000–2006 and 2006–2012, land cover and land use changes were relatively small (they occurred on 0.12%, 0.13% and 0.09% of the entire territory, respectively). 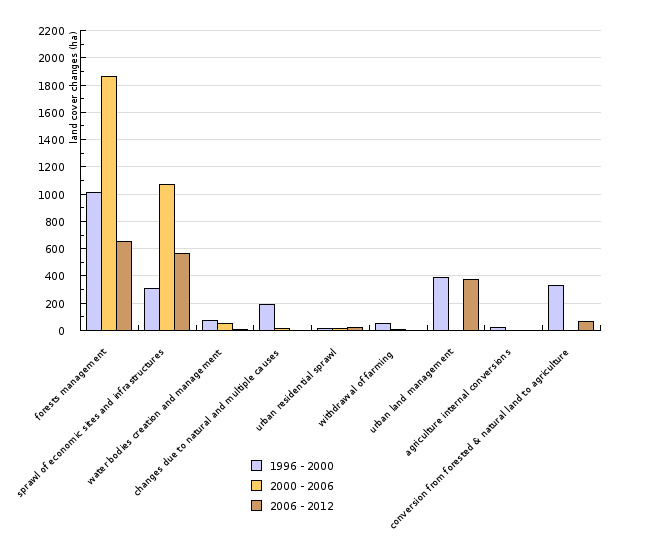 The majority of detected changes were related to forest management and infrastructure construction. This indicator shows the characteristics and changes in land cover and land use in Slovenia in 1996, 2000, 2006 and 2012, recorded using the CORINE Land Cover methodology. The detected processes of changing categories or land cover flows are also presented, as derived from the analysis conducted under the LEAC (Land and Ecosystems Accounts) methodology, developed by the European Environment Agency. • preservation of production potential of land for agricultural use and balanced supply of mineral resources. More than half of Slovenia's land area is covered by forests (56%, or 58% including shrub forest), 4% by other predominantly natural vegetation (natural meadows, wetlands, water and sparsely covered or barren land), 35% by predominantly agricultural land and slightly less than 3% by artificial surfaces. 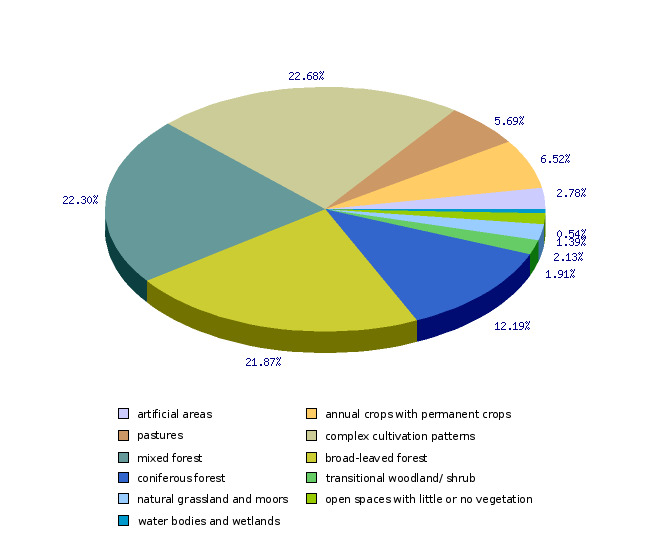 This breakdown of land cover and land use is based on the interpretation of satellite images taken in 2012 according to the CORINE Land Cover methodology (CLC2012). The same methodology was used to determine land cover and land use in 2006 (CLC2006), 2000 (CLC2000) and 1996 (CLC95), which enabled an analysis of changes to be conducted. Changes detected on the territory of Slovenia are relatively small and represent slightly over 0.1% of the entire territory in any of the studied periods (0.12% between 1996 and 2000, 0.13% between 2000 and 2006 and 0.09% between 2006 and 2012). However, we should take into account that the used methodology only identifies changes in land cover that were larger than 5 hectares. Artificially surfaced areas have increased; between 1996 and 2012, surfaces covered by road infrastructure increased by 1090 ha, while industrial and commercial areas increased by at least 228 ha, with the greatest increase having taken place in most recent years. The average number of household members has been decreasing in Slovenia, which usually co-relates with increasing housing area per person and is reflected in a considerable increase in housing areas in most European countries. Nevertheless, only a minor increase in such areas has been recorded in Slovenia (11 ha between 1996 and 2000, 18 ha between 2000 and 2006 and 22 ha between 2006 and 2012), which can be attributed to measures that largely limited housing construction to urban areas. The dispersed settlement pattern in Slovenia, where half of the population lives in settlements with fewer than 2,000 inhabitants, can also mean a higher number of minor changes that cannot be detected using the CORINE Land Cover methodology. Using the analysis of change flows between individual categories of land cover/use (LEAC), which is also used by the European Environment Agency, we can establish that the greatest changes occurred within the category of forest areas. In the period 1996–2000, approximately 520 hectares (mostly deciduous forests) were cleared and reforested, 1,700 hectares (mostly coniferous forests) in the period 2000–2006, and 425 hectares in the period 2006–2012. In the same period, less than 350 hectares of shrub land were converted to forest in categories as detected by the used methodology. Forest clearing was also required for the purpose of infrastructure construction. Approximately two thirds of newly built-up areas had been forests, while the remaining third had been agricultural land. Although forests are a prevailing land cover category in Slovenia, they are not evenly distributed throughout the territory. The largest continuous forested areas cover the Dinaric-karst plateaus of southern and southwestern Slovenia and the Alpine slopes in the north and west. Within the natural conditions in Slovenia, interspersed forest and agricultural land can be characterised as a diverse landscape of high quality. Such categories, classified as “Complex cultivation patterns” and “Land principally occupied by agriculture, with significant areas of natural vegetation”, cover 14% and 9% of the Slovenian territory, respectively, which, when combined, amounts to almost a quarter of Slovenia's land area. Fragmentation of agricultural land is undesirable from the perspective of agricultural production. However, from the perspective of cultural landscape, diversity of landscape patterns and great variety in land use enable greater biodiversity and represent the natural/cultural heritage and identity of the Slovenian landscape. According to CLC2012, the category “arable land” occupies 112,237 ha, vineyards 15,689 ha and other permanent crops 3,586 ha, which, when combined, amounts to approximately 6.5% of Slovenia's land area. In the period 1995–2000, the greatest increase within agricultural land was recorded in pastures, while non-irrigated arable land and the categories of “Complex cultivation patterns” (14%) and “Land principally occupied by agriculture, with significant areas of natural vegetation” slightly decreased. In the period 2000–2012, greater changes in the area covered by individual agricultural land categories were not detected. In the period 2000–2012, there were no developments that would greatly affect water bodies and wetlands in Slovenia, except natural changes that occurred in the areas of intermittent lakes – pastures on the Planina Polje (CLC95) and wetlands in the Cerknica Lake area (CLC2000).